​São Paulo, February 3, 2015 - ​Votorantim Cimentos, the largest company in Brazil's building materials industry notes that the proportion of alternative raw materials used in Brazilian cement is one of the best in the world, according to data from the Brazilian construction industry association SNIC. In 2013, 91% of all the cement commercialized in Brazil had some additive in addition to the clinker derived from limestone used in cement production. 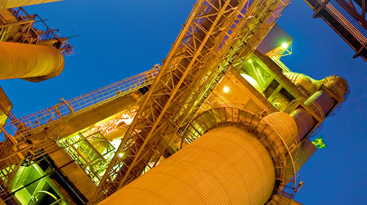 “Brazil has one of the highest clinker substitution rates in the world and this is due to industry research and development of technologies to incorporate natural substitutes and even steel industry dejects into cement manufacture”, says Edvaldo Rabelo, executive director of energy, sustainability and safety for Votorantim Cimentos. “The addition of alternative raw materials ensures a product as strong and durable as cement made with pure clinker and generates gains, such as reductions in gas emissions, water consumption and the burning of fossil fuels in the production process', he explains. Votorantim Cimentos Research and Development manager, Silvia Vieira, mentions as an example the company plant in Porto Velho (Rondonia), which is considered a model in climate change initiatives. In operation since 2009, the unit also saw alternative raw materials as a means of reducing operational costs. The plant is located in the North of Brazil, where there is a lack of limestone for clinker production and the high cost of transporting it from other mines is prohibitive. “This led us to think about producing calcined clay pozzolan at the plant and increasing the proportion of substitutes. After research, the involvement of scientists to establish technical specifications and diverse tests, we developed our own furnace for producing the material”, states Silvia, who has a PhD in Geology. The construction of the Porto Velho unit consumed an investment of R$176 million and 1.6 million man/hours of labor. “The investment was very similar to what would be spent on a regular plant, but this unit is superior in ecoefficiency. Our emissions are half those of a regular plant, we spend 35% less energy and consume 40% less water than a conventional factory that produces cement without additions”, Silvia concludes. Votorantim Cimentos will present the Porto Velho case and its sustainable initiatives at the 2015 CBI Brazil & Latin America Congress, which is taking place on Wednesday (4) and Thursday (5) of this week, at the Hotel InterContinental in São Paulo. Edvaldo Rabelo, global executive director of Votorantim Cimentos, will talk about the company's sustainability policies on the first day from 11:30 a.m. Silvia Vieira, research and development manager, will comment on the addition of sustainable materials in cement production on the second day of the event. Active in the construction materials business (cement, concrete, aggregates and complementary products) since 1933, Votorantim Cimentos is a major global player in the industry with an annual production capacity of 53.9 million metric tons. The company has units located strategically close to the most important emerging consumer markets and operates in 13 countries other than Brazil: Argentina, Bolivia, Canada, Chile, China, India, Morocco, Peru, Spain, Tunisia, Turkey, the United States and Uruguay.